Vancouver Opera’s third opera in the 2013-14 season was Mozart’s perennially popular Don Giovanni – hardly the most daring of choices, but one that is popular and never fails to please. As it turns out, the opening night performance on March 1st exceeded all expectations, with world-class musical values (from an all-Canadian cast) and clever, fast-paced production. The production, directed by Kelly Robinson and co-produced with Canada’s Banff Centre, dealt exceptionally well with the episodic nature of da Ponte’s libretto. Featuring a two-tiered unit set with 3 panels and 2 staircases, Bob Bonniol’s highly realistic projections seamlessly transitioned from street to ballroom to bedroom as necessary. The only projection misstep was a series of amorphous red blobs highly reminiscent of Rorschach tests in the final scene. They eventually evolved into giant statues, but it was more puzzling than dramatic. As a result, the visual element of the evening was dazzling, colourful, and never lagged – sadly slightly undermined by Robinson’s rather generalized characterizations. A real shame, considering the fact that I’ve seen every member of the cast act marvelously. As a result, it was difficult for Daniel Okulitch to make the impact that the role calls for. Switching between a bitter alcoholic and a narcissistic aristocrat without much motivation, Okulitch nevertheless impressed with his nimble, elegant singing. Particularly impressive was his ‘Deh vieni alla finestra’, ornamented beautifully and sung in the softest pianissimo imaginable. As his servant Leporello, Stephen Hegedus impressed in his big aria – more importantly, he made the most out of his extensive recitatives with Don Giovanni. Rachel Fenlon and Aaron Durand made a vivacious, youthful pair as Zerlina and Masetto, both making the most of their arias. Krisztina Szabo’s high mezzo is ideal for Donna Elvira, and her commitment and intensity were outstanding. Her ‘Mi tradi’ (sung in the soprano key) was not only perfectly sung but also demented in the best way. Best of all, however, were Colin Ainsworth and Erin Wall as Don Ottavio and Donna Anna. Well-known for his experience in Lully and Rameau’s haute-contre roles, Ottavio’s wide range and floridity did not seem to tax him in the slightest. Though his ‘Il mio tesoro’ was impressive, it was his stunning ‘Dalla sua pace’ that won the audience over. Erin Wall has made Donna Anna something of a calling-card role – her even, flexible voice encompasses all of the role’s demands from the wide-ranging leaps of ‘Or sai chi l’onore’ to the floated high notes and coloratura of ‘Non mi dir’. Not only that, she gives a stunningly intense portrayal and had the audience pinned to their seats during her dramatic recitatives in act 1. Stuart Bedford led the Vancouver Opera Orchestra in a polished, elegant account of the score, and balance and ensemble were exemplary considering the set featured a walkway extending in front of the pit. This exact walkway, however, resulted in a somewhat muted orchestral sound. Overall a highly enjoyable evening at the opera, worth seeing mainly for the uniformly excellent cast. Although I’ve done my best to review all of the new recordings I’ve heard this year, there’s still a huge pile of CDs sitting on my desk. I was hoping to review all of these other recordings by the end of the year, and since I don’t have the time to write full reviews, I’ve decided to write a little about each in one big post. The fact that I’m writing less certainly doesn’t mean that I have less to say about the recording, or that they’re not as good – it’s just an unfortunate necessity of time! The young Canadian bass-baritone has been making a name for himself as a versatile performer, both as an opera singer and recitalist. This song recital contains the ever-popular Dichterliebe and Ravel’s Don Quichotte à Dulcinée, as well as songs by French composer Guy Ropartz and Jonathan Dove’s increasingly popular Tennyson settings. Sly shows an equal affinity for all three languages, as well as the stylistic differences between the Ravel and Ropartz. Schumann’s Dichterliebe is hardly underrepresented on recordings, but it’s rare for a singer to record it so early in his career. This has its advantages and disadvantages: his more youthful interpretation is more emotional and impetuous than usual, bringing more contrast to the individual songs, but at the same time he’s not as developed vocally. It’s still a very accomplished performance, but I’d love to see how his interpretation develops over time. Dove’s evocative Tennyson songs shows off his lovely voice and excellent diction, but he really shines in the French pieces. Ravel’s Don Quichotte chansons can be difficult to pull off effectively due to their brevity and simplicity, and although Sly is still far from the aged, experienced Don Quichotte, his musicality allows him to make the songs unique. He is particularly effective in the expressive ‘Chanson épique’, which displays his vocalism and musicality in full. Guy Ropartz is a composer I’m not familiar with, but this performance of his Heine settings make a strong case for further exploration of his music. It’s comprised of four poems along with a short prelude and postlude, and although it was written in 1899 is musically reminiscent of early Debussy or Fauré chansons rather than the later, more chromatic French Impressionist works. 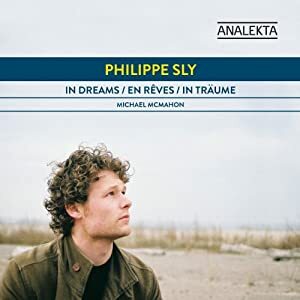 Sly is obviously very comfortable with the French style, and pianist Michael McMahon provides sensitive and detailed playing throughout. Baritone Christian Gerhaher is one of the most accomplished and intelligent lieder singers performing today, so it’s always interesting to see what programs he comes up with. I had the pleasure of seeing him perform in Vancouver this past May, and I was delighted to see that he recorded the Beethoven and Haydn pieces that were so effective live. While the recording obviously does not quite capture the extraordinary charisma and immediacy of his live performances, his natural, intelligent, yet expressive singing comes through. These classical songs are contrasted with two major works of the Second Viennese School, Schoenberg’s Book of Hanging Gardens and Berg’s Altenberg Lieder. Schoenberg’s large-scale song cycle, based on poetry by Stefan George, marked the beginning of his shift into atonality. 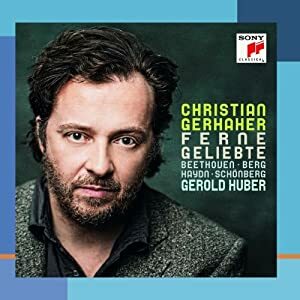 Gerhaher brings out the lyricism of the vocal line, and displays a multitude of colours to complement the text. His performance proves that this music can be intellectual as well as accessible and deeply moving. Though Berg’s Altenberg Lieder were notoriously part of Schoenberg’s 1913 Skandalkonzert, they are in fact highly lyrical and passionate. Gerhaher’s singing is intense and captivating, and the cycle is a perfect vehicle for his lyrical voice. The lieder are performed with piano, and Gerold Huber is particularly impressive in the demanding orchestral reduction of the Berg. Lyric mezzos often have an interesting transition into their late careers – at a certain point, Angelina and Cherubino just don’t cut it anymore. As a result, many mezzos experiment with different fachs, whether singing lower soprano roles or dramatic mezzo roles. The Swedish mezzo Anne Sofie Von Otter has long left her Dorabella and Oktavian days behind her, and now sings Fricka, Brangaene, and duets with Elvis Costello equally comfortably. Her latest recording is equally interesting, consisting of Italian baroque music and avoiding any repertoire overlap with the other similarly-themed recordings that seemingly come out by the dozen these days. 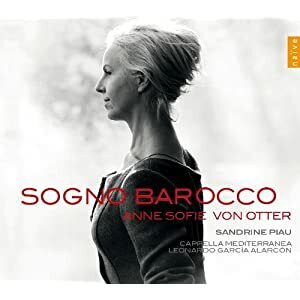 The most well-known tracks are the Monteverdi selections, including the two duets from L’Incoronazione di Poppea with the brilliant Sandrine Piau. Piau also joins Von Otter for a lovely duet from Cavalli’s La Calisto, aptly named “Dolcissimi baci”. Apart from two Cavalli instrumental tracks, featuring the enthusiastic and colourful playing of the Capella Mediterranea, the rest of the recording is composed of monologues. The most successful is Penelope’s intense scene from Monteverdi’s Il Ritorno d’Ulisse in Patria, which benefits from Von Otter’s well-known dramatic instincts and musicality. Overall, it’s an outstanding and unique recording in the well-populated field of baroque vocal recitals, and is well worth acquiring. In a world where countertenors are arguably more sought after than mezzos in armour, it’s surprising to hear one that clearly distinguishes himself from the rest. British countertenor Iestyn Davies is fast becoming recognized as an exceptional musician and voice in a field that includes many other excellent singers, and his newest recording is proof of that. Gone are the days where countertenors had breathy, high voices – Davies’ voice is rich, even, and almost mezzo-like in range. It’s a surprising choice to record an entire disc around music written for Gaetano Guadagni – unlike his castrato colleagues, Guadagni didn’t place much importance on flashy vocal writing, and played a role in Gluck’s opera seria reforms. A risky choice for a young singer, perhaps, but one that ultimately pays off. Davies displays a mellow, even voice with flawless legato, demonstrated particularly well in the aria from Handel’s Saul and a stunning aria by JC Smith. However, he still has a chance to show off his coloratura technique in Handel’s florid “Destructive War” from Belshazzar and two rather flamboyant arias from Hasse’s Didone Abbandonata. Guadagni’s most famous role, Gluck’s Orfeo, sits awkwardly for many countertenors, but Davies more than compensates with a beautiful tone and a musical, restrained interpretation. More successful is the expressive aria from Gluck’s Telemaco, as is an aria of Guadagni’s own composition. Jonathan Cohen conducts the period Arcangelo with sensitivity and incredible virtuosity where needed. 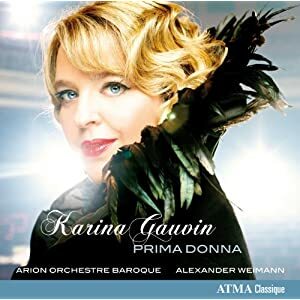 One of the most in-demand baroque concert singers, Canadian soprano Karina Gauvin has long been known as a connoisseur’s singer. However, the recent baroque revival has greatly increased her visibility, and her latest recording proves that she deserves to be at the top. Accompanied by the Arion Orchestre Baroque, Gauvin sings a selection of Handel arias written for Anna Maria Strada del Pò, plus two arias by Leonardo Vinci and Antonio Vivaldi. Throughout the recording, Gauvin shows that she is surely in her prime – a beautiful, womanly voice, flawless technique, and fine musicality down to the smallest detail. The arias all suit her perfectly, from the showy “Scherza in mar” from Handel’s Lotario to the fluid “Care selve” from his Atalanta. One might wish for more variety in programming (out of the 25-or-so Handel operas that del Pò sang in, only 7 are represented here), but her astonishing Alcina arias put that to rest. Her deeply moving “Ah, mio cor” is almost enough to make this DiDonato superfan regret that Curtis cast Gauvin as Morgana instead in his recording of the opera. It may not be as flashy or varied as other baroque recordings, but there’s nobody that can sing this music as gorgeously as Gauvin. Often publicized as opera’s hippest, sexiest soprano, it may therefore come as a surprise that her latest album is an understated, intimate recording. A mix of sacred pieces, arias, and duets, the programme is designed to exhibit her ever-maturing musical and vocal skills. Although most of the pieces are quite well-known, they are all well-suited to her voice. Particularly effective are two of John Dowland’s lute songs, which show off her distinctive voice and impressive interpretive skills. Also impressive is the aria from Handel’s Acis and Galatea; criticisms of her supposed poor breath control are proven wrong. As with most recordings, the least successful are the most popular pieces – Handel’s “Ombra mai fu” sounds a little uncertain, and her voice simply isn’t suited to the gravity of Purcell’s Dido. She’s joined by countertenor Andreas Scholl for three duets from Handel’s Rodelinda, Monteverdi’s L’Incoronazione di Poppea, and Pergolesi’s Stabat Mater. 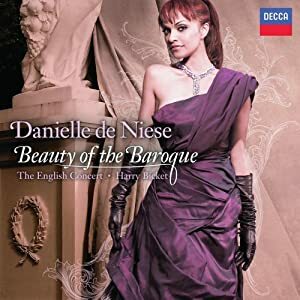 The most effective is the Monteverdi – De Niese is justly famed for her interpretation of Poppea, and this recording is simultaneously pure and sensual. It’s actually very enjoyable, and is undoubtedly De Niese’s best recording to date. In an age where DVDs more common that CDs, it’s almost shocking to see a full opera being released by a big label. 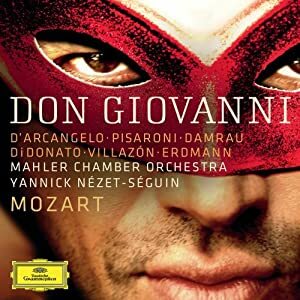 The first in a promised series of Mozart recordings featuring Rolando Villazon and conductor Yannick Nezet-Seguin, this Don Giovanni features the starriest names in the operatic world today. Despite this, there’s an excellent sense of ensemble between cast and conductor. It’s a very fast reading of the opera, but the singers obviously have no problem in keeping up and the young Mahler Chamber Orchestra matches them in virtuosity. The most engaging performance comes from Luca Pisaroni as Leporello. It’s hard to believe that at the time of recording, this was still a relatively new role to him. Vocally, of course, he is impeccable, but has an excellent sense of timing and is overall a charming Leporello. Some of the high points of the recording are the secco recitatives between Don Giovanni and Leporello – it’s always a delight to hear native speakers make the most of those seemingly throwaway lines. At some points, however, I could have sworn that they switched lines. Contrary to common practice today, Giovanni has a deeper, lower voice than his servant, reminiscent of productions in the 50s that featured Pinza or Siepi. Despite his deeper voice, D’Arcangelo has the coloratura and range to surmount the technical hurdles of “Fin ch’han dal vino”. However, his soft singing is less effective, particularly when he tries to scale down his voice to match his Zerlina in “La ci darem”. Probably the most controversial casting choice in the recording, Rolando Villazon proves to be an effective Don Ottavio. After his much publicized vocal problems, he has been turning to Mozart, much to the horror of some audience members. Don Ottavio’s two fiendishly difficult arias may not be the best place for any tenor to begin, but Villazon tackles them head-on and displays a solid technique and good breath-control. In addition, he makes the most out of his much-maligned character – instead of the usual wimpy, incompetent aristocrat, Villazon’s Ottavio is fiery, passionate, and a real match for Giovanni. As his fiancée, Diana Damrau is every bit the wronged woman. Although her voice may have seemed a little light for the role, her “Or sai chi l’onore” is impressively dramatic, and needless to say her “Non mi dir” is exquisite. One of the advantages of this recording is that the three women are well differentiated in sound; there’s never any confusion in the ensembles. Traditionally, either Donna Elvira or Zerlina can be sung by a mezzo, and in this case Joyce DiDonato’s high mezzo is a perfect fit for Elvira’s often awkward tessitura. DiDonato’s technique is now nearly legendary (even the most bitter fans go into raptures whenever she trills), but her Elvira is much more than glorious vocalism. Aside from Pisaroni, DiDonato has the clearest idea of who her character is, and how to express that vocally – Elvira is no madwoman, but simply a passionate woman driven mad by jealousy. Her “Mi tradi” is transposed, but otherwise is a nearly perfect recording of the aria. Mojca Erdmann’s Zerlina at the Met last fall was criticized for being underpowered and shrill, but with a smaller orchestra she sounds lovely, if unremarkable. Although it may not supplant Giulini or Furtwangler, it’s an exciting performance from a highly charismatic cast. One of the most acclaimed operas written in the past 20 years, this is the second commercial recording of Jake Heggie’s 2000 opera. 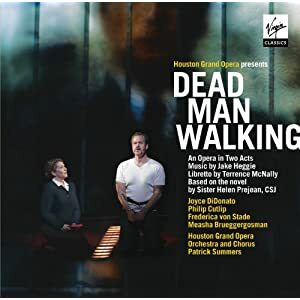 To have two recordings of such a recent opera is rare, but the casting of Joyce DiDonato as Sister Helen and Frederica Von Stade as Joseph’s mother fully justifies it. It’s a shame that these performances were not filmed for DVD release instead – I feel like being able to watch as well as hear this production would add to its impact. Nevertheless, it’s still a highly moving experience, almost entirely due to Joyce DiDonato’s performance as Sister Helen. DiDonato sings the role in a less overtly ‘operatic’ way than Susan Graham in the original recording, but both interpretations are equally effective. In many ways, Sister Helen is the perfect role for DiDonato, who has always emphasizes meaning rather than just singing. Phillip Cutlip is engaged and sensitive as the rather two-dimensional Joseph de Rocher, but the character is far less interesting than that of his mother, sung by Frederica Von Stade. Joseph’s mother is arguably the most conflicted character in the opera, and struggles to reconcile her love for her son with her knowledge of his crime. These were Von Stade’s final performances in a staged opera, but she is absolutely devastating in the role. Her voice is still admirably warm and rich, and Heggie has done a wonderful job tailoring the role to suit Von Stade’s voice and artistry. All of the smaller roles are luxuriously cast, with Measha Bruggergosman as Sister Rose, Susanne Mentzer as Jade Boucher, and John Packard (Joseph de Rocher in the world premiere) as Owen Hart. Patrick Summers conducted the premiere, and he gives an even more detailed but equally charged performance here. 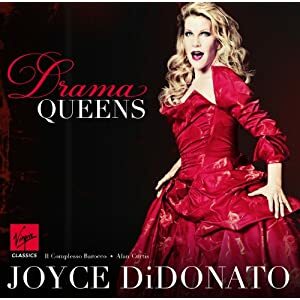 I’ve been anticipating the release of this CD for months, even going as far as trying to piece together the program (see the list here: https://nonpiudifiori.wordpress.com/2012/08/23/joyce-didonatos-drama-queens-a-prediction/ I got 7 out of 13, which isn’t bad!). I absolutely lack the objectivity to provide any sort of decent review, but it’s pretty much universally agreed that it’s her best recording to date. Her voice has grown in size, richness, and range, and particularly effective are Porta’s “Madre Diletta” (with Caballe-worthy pianissimos) and Orlandini’s fantastic “Da Torbida Procella”. Dazzling singing and orchestral playing and absolutely no missteps make for an indispensable recording.